Usually the timing of retro reviews makes sense. For instance, if there's a new Mario game coming out, I'd probably want to check out a past Mario game for a retro review. For tonight's retro review, there really is no reason for it, other than I wanted to try this game out. 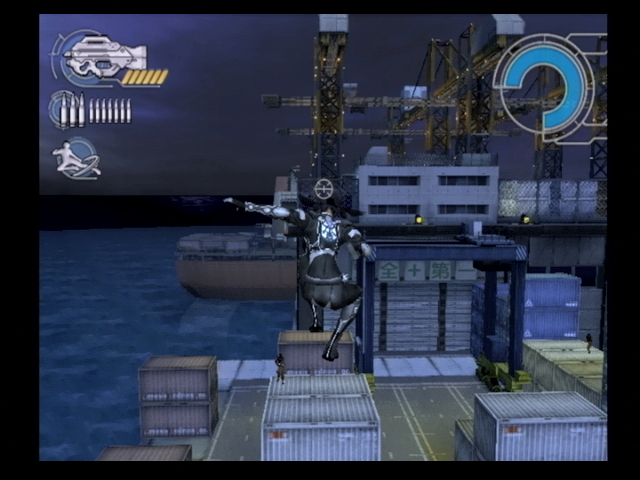 While I'm glad I did, and while I did enjoy some aspects of it, as you'll see with my review, Ghost in the Shell: Stand Alone Complex's PlayStation 2 game is far from perfect. Anime and I aren't on the best terms. For every anime I do like, there are about 100 I don't care for whatsoever. An anime that is on the fringe of like and dislike is Ghost in the Shell: Stand Alone Complex. It's somewhat too over-my-head with all of its jargon, but it's darn cool to watch and has a tremendous soundtrack. Thus, I was excited to try out the PlayStation 2 game based off the show and review it. If you are familiar with the Ghost in the Shell: Stand Alone Complex anime, then the game's story is something that you can easily understand. It helps to know the characters, though it's not completely necessary. Just be prepared to be annoyed by the high-pitched Tachikoma robots, regardless. If you're not well versed on the anime, or you have a hard time following the techno-babble and police speak used in the show, then you're going to be completely confused by the game's story. 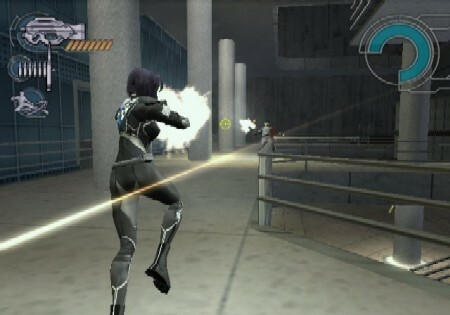 Essentially, the premise of the game is that an investigation involving weapons that were supposed to be destroyed have found themselves on the black market. It's up to Section 9 with aid of the military to discover who is behind this crime. 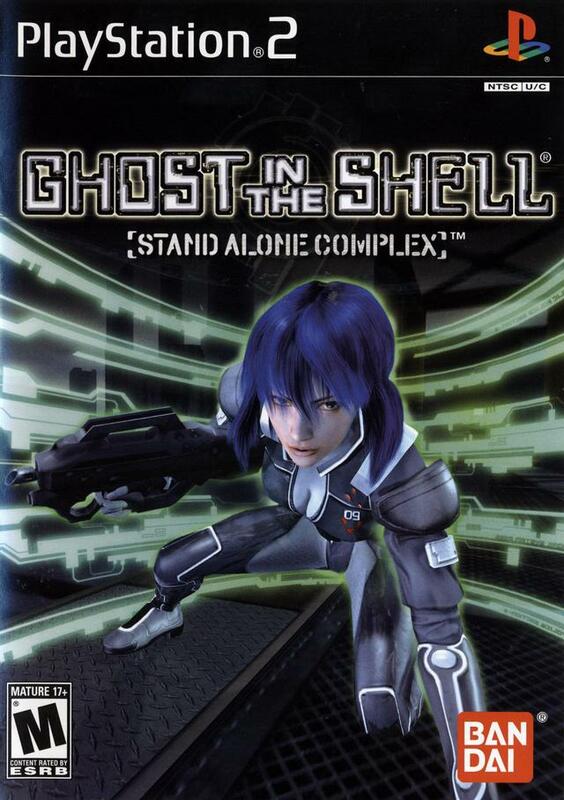 Ghost in the Shell: Stand Alone Complex is a third-person shooter that has your character, either Major Motoko Kusanagi, the cool, calm, and collected cyborg leader of field operations for Section 9, or Batou, a less mobile and agile hunk with a good sense of humor, running, gunning, wall jumping, and hacking their way through one of twelve missions. Each mission generally has you moving from point of interest to point of interest, always marked with an indicator, but there's still exploration to be found in discovering how to get to said marker. giving a lot of character to the game's missions. 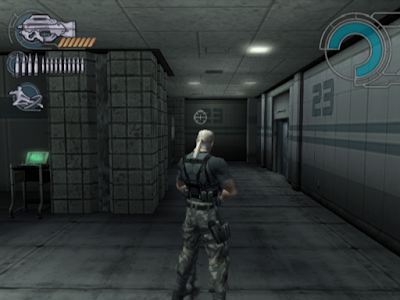 With Stand Alone Complex, you switch off between missions as the Major and Batou. 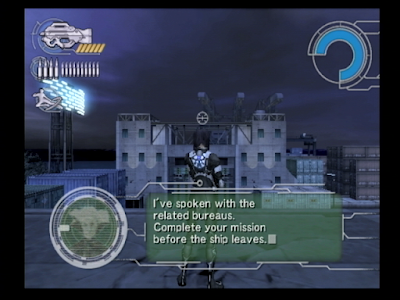 The Major's missions feature more platforming than what Batou's missions offer. The Major has the ability to jump off walls, though this can only be done twice in a row for the only genuine reason than to keep players from being able to climb Slyvester Stallone Cliffhanger-style heights. The R1 button is used to grab and hold onto things like ledges, something incredibly useful for areas with huge, death-bringing chasms. Still, I sometimes forgot that the game doesn't auto-grab onto ledges. To be fair, this was after a lot of playing time with the Uncharted series, a game where holding onto ledges is automatic. Look before you leap, Major. 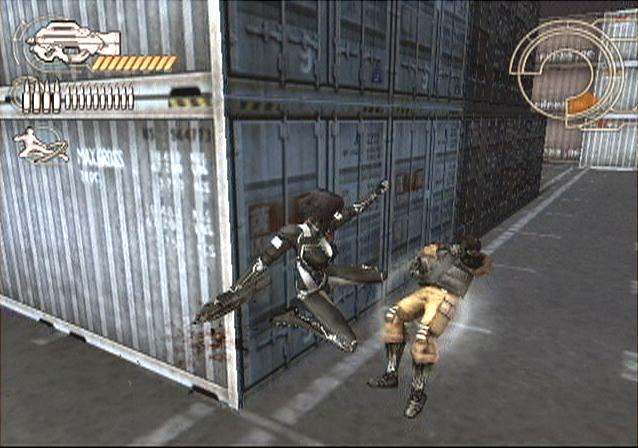 Additionally, both characters can perform an evasion maneuver, with the Major's being more visually striking. However, this move also makes the camera spin around in a painful-to-predict fashion, usually putting you in harm's way as you try to recenter the camera on your intended target. All the platforming and shifting around levels is performed as you mow down enemy scum, which isn't as easy as you might think. Stand Alone Complex lacks an auto-aim or even an aim assist feature, so if you aim isn't true, you can find yourself at the receiving end of a blitzkrieg of bullets, feverishly attempting to center a target in your aiming reticule. Thankfully, checkpoints are common, so you never really lose a lot of progress when you wind up badgered with bullets and incapacitated. The point here is that the controls aren't the greatest in Stand Alone Complex, and they will frustrate easily annoyed gamers. No auto aim or auto assist makes aiming a tad difficult. At the start of each mission you begin with a submachine-gun. However, you can also grab a second gun to have two on hand at any given point. Guns, grenades, and ammo are dropped by enemies that have been defeated, and through careful exploration of levels, you can come across health-boosting regeneration kits and rarer ammo for the more powerful weapons that come upon. Weapons range from deadly sniper rifles to machine guns, to rocket-propelled grenades and grenade launchers. Melee combat is extremely useful for close-combat situations. When your foe is too close for comfort, the Major or Batou can utilize highly capable close-quarters combat to punch or kick them into submission. 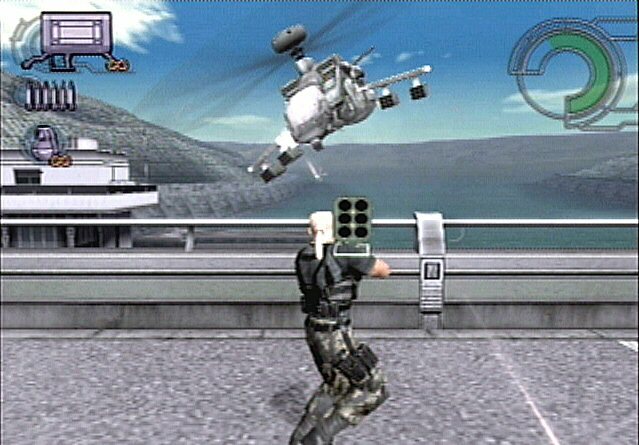 It's really satisfying to pulverize an enemy, sometimes sending them flying over a railing in the process, and it's all done in slow motion with a cunning camera angle for you to cherish the spectacle of it all. The Major does this for kicks. 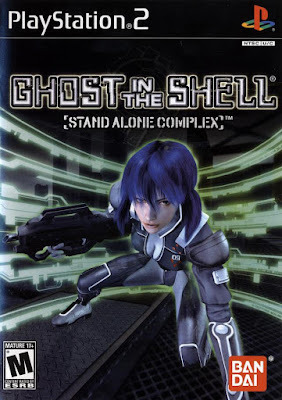 One innovation that the Ghost in the Shell: Stand Alone Complex anime series brings to the gameplay of its PlayStation 2 game is the ability to hack ghosts, essentially conscious beings within the bodies of characters, or shells. Hence, the name Ghost in the Shell. (Was that an "a-ha" moment for you like it was for me?) Anyway, with this hacking ability you can take control over certain enemies, and use them to learn of enemy positions as well as mow them down without worrying about losing health in a skirmish as the Major or Batou. It's just a shame that the opportunity to hack ghosts is something that is pretty rare to execute, so this defining feature of this Ghost in the Shell game is underused. While Stand Alone Complex is over pretty quick with its aforementioned twelve missions, there are multiple difficulties to play on, the option to try to beat each level without dying, an unlockable mode where you play through the levels while shooting at well-hidden Japanese fans, and multiple costume unlocks. There is also a multiplayer mode, though this does not feature bots, and two players alone is hardly any fun... or the mode for that matter with its insanely small maps (though the amount is quite copious). Bring down that enemy chopper, Batou, with some serious hardware. The character models of Stand Alone Complex are the star of the game's presentation. They have an incredible amount of detail for a PlayStation 2 game, and they still are rather impressive to gaze upon. Meanwhile, most levels are quite bare and lack color, something that gets very visually repetitive as the game goes on. However, if you like gray and brown, then do I have a game for you! Additionally, there is a sparse amount of interactivity with the environment. Expected things like glass being blown out and minor debris coming off from walls occur, but if you blast a wall with a rocket launcher, you're not going to find a dent in it. Gray, gray, gray-- far as the eye can see. Sound-wise, the music sadly does not compare at all to the exquisite compositions of Yoko Kanno's Ghost in the Shell: Stand Alone Complex anime. This is just a grating imitation with nothing memorable or worthy of mention whatsoever. Voice work is well done and beyond adequate. The actors certainly earned their paychecks with this game. All in all, Ghost in the Shell: Stand Alone Complex is sure to please fans who want to dive into more of the anime series's world. Even with those with a desire to get a unique story and an expanded look at the Major, Batou, and the rest of Section 9 won't find a lot to keep coming back to. The controls are a bit meddlesome, the visuals are rather unappealing aside from the character models, and the multiplayer isn't compelling whatsoever. Still, you could do a lot worse than this PS2 take on an anime classic. It's just not the game that Ghost in the Shell truly deserves.